With almost one kilometre of absolute river frontage you can enjoy uninterrupted river views from your luxury self-contained accommodation or caravan and camping sites. Drive your boat right up on the bank and step out into Renmark caravan and camping park heaven. Our range of fun activities include a resort pool, giant jumping pillow, full sized tennis court and adventure playground, water park and splash play area! We ensure your comfort with facilities like our camp kitchen, wireless internet access and spotlessly clean amenities. 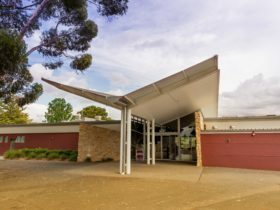 BIG4 Renmark Riverfront is the proud recipient of the South Australian Tourism Industry 2014 Best Tourist and Caravan Park award and has been a gold medal finalist in previous years. We also hold a Silver Gumnut Award and use sustainable business practices that address environmental, economic and social elements in running our holiday park. We actively encourage our guests to join us in our commitment to the environment by participating in the Travel’n Green Gumnut Awards program. Refer to our website for details. Perfect for large families or groups our brand new Three Bedroom Riverfront Villas are situated overlooking the Murray River and are fully self contained. 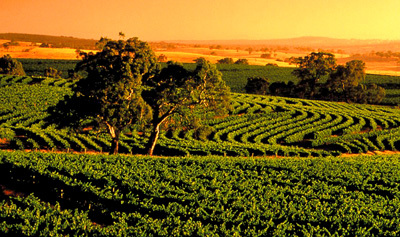 They have everything you could need for a memorable and comfortable holiday. 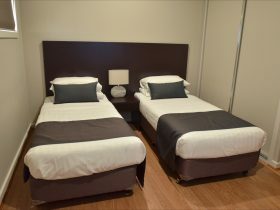 All accommodation at BIG4 Renmark Riverfront Holiday Park is non-smoking. Please be advised: Work Law Health & Safety state that operators must comply with the Australian Standard AS/NZS 4220:2010. “Children under the age of 9 years are not permitted to use the top bunk; children must not play on top bunk”. Please take this into consideration when making your booking. If you’re a family looking for a beautifully designed cabin, you’ve found it! Our Two Bedroom Riverfront Villas have two bedrooms separate to the main living/dining area providing privacy, space and comfort for your entire family. Sit back and enjoy the view of the Murray on your private deck. 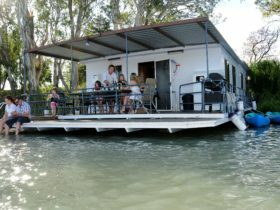 This is an ideal holiday option for staying on the Murray River and is easily accessible for wheelchairs and prams. Comfortably accommodating six people with two bedrooms, this Villa has a spacious living area and features a private deck with outdoor setting. 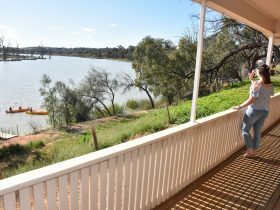 The Poolside Villas have a great view of the “other” waterfront here at BIG4 Renmark. You will be conveniently located on our waters edge accessible for a quick dip or a long soak. These fully self contained villas with all the comforts of home have everything you need for a memorable Murray River holiday. Right on the banks of the Murray River our Riverfront Powered Sites are perfect for taking in the view and action on the water. Unhitch or pitch and you’ll soon be enjoying the passing parade of paddle steamers, boats, and the odd duck! Bring your home away from home to our Powered Sites and enjoy the easy accessibility of our Camp Kitchen, clean amenities and fun activities to be used at your leisure. There’s nothing quite like an Unpowered Site to truly take you back to nature, so leave all the plug-ins at home and get out and about with your friends and family on Murray River holiday. If you’re lucky you might even spot some sleeping koalas in the tree tops!